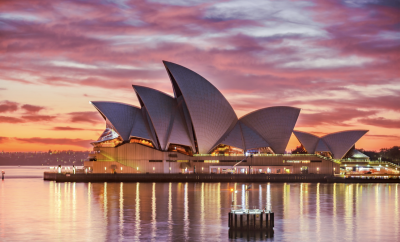 These 10 incredible city cliffs around the globe are a marvel of architecture geniuses, not just single buildings but entire towns built on the tops of soaring cliffs or carved into the sides of mountains. 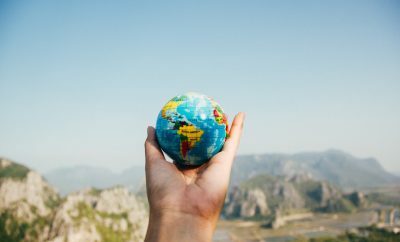 These towns are breathtaking sights and equally thrilling when you are looking out from one of these towns’ buildings into the ocean or the earth below. 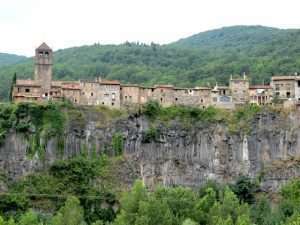 Castellfollit de la Roca is one of the most beautiful architectural villages in Catalonia Spain. It’s built onto the basalt cliffs between two rivers and most of the buildings seem to be right at the edge of the cliff offering the illusion that they could tumble down any time. The oldest parts of the village were built in the Middle Ages and these houses were made of volcanic rock. Rocamadour is a tiny village built on the rocky face above a gorge on the Alzou River in southwest France. 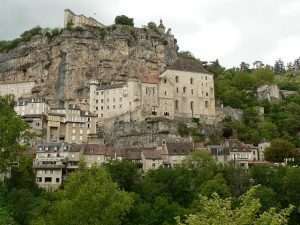 The village, which dates back to the 12th century, rises in stages up the side of a cliff and steps ascend from the lower town to the churches. 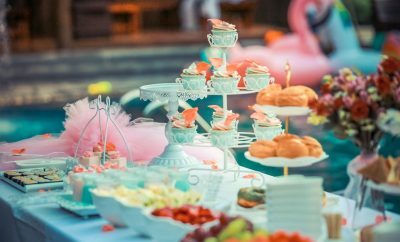 Today it is popular again by both tourists and pilgrims who come to honour St. Amadour the village’s namesake. 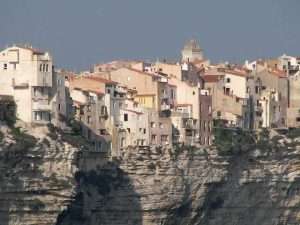 Bonifacio is a city at the southern tip of the French island of Corsica. 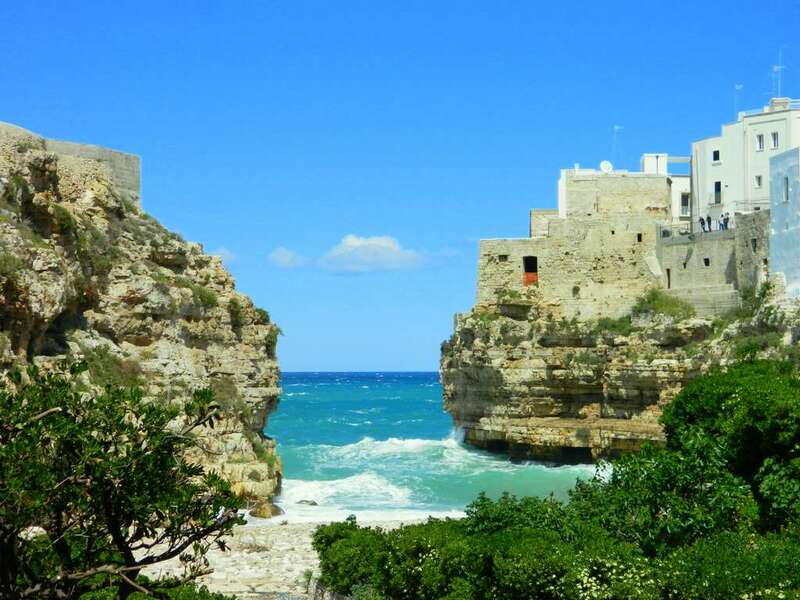 This is an ancient and unique fortress town built along the cliff-top, which are at about 70 meters above water. Named after its once flourishing wineries- bodegas- Setenil is unique village. Its houses were directly built into the rocky cliff and cleverly use the rock as roofing and insulation. The cliffs and homes work together so naturally, it is difficult to see whether the town formed around the boulders, and vice versa. 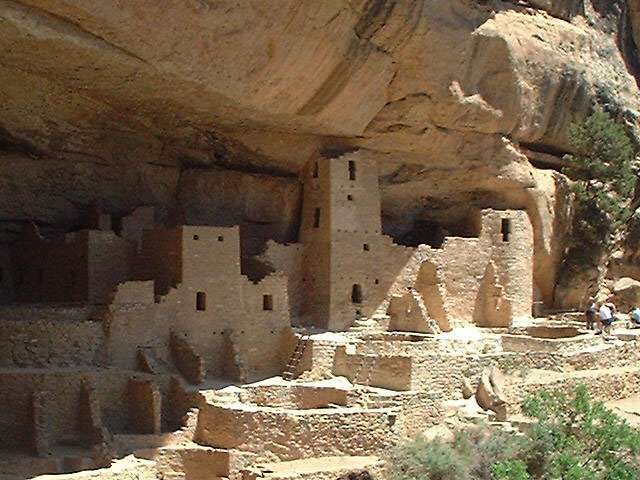 Mesa Verde, in southwestern Colorado, is home to the famous cliff dwellings of the ancient Anasazi people. It may be the most significant archaeological preserve of Native American culture in the US. In the 12th century, the Anasazi started building houses in shallow caves and under rock overhangs along the canyon walls. 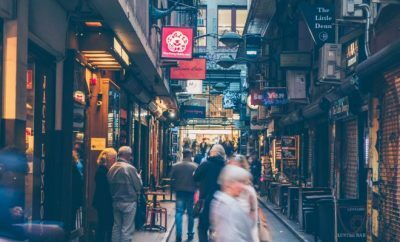 Some of these houses were as large as 150 rooms. 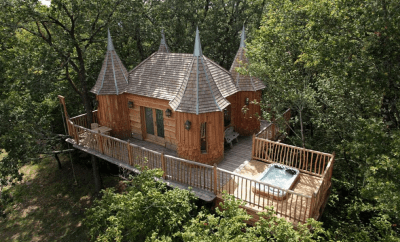 The most famous of these are called Cliff Palace and Spruce Tree House. By 1300, all of the Anasazi had left the Mesa Verde area, but the ruins remain almost perfectly preserved. These cliffs are dotted with ancient cave dwellings of the Tellem people. 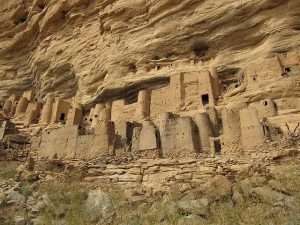 These people carved their caves into the cliffs of the escarpment so that their dead could be buried high above the flash floods that are common to the area. They built dozens of villages along the cliffs above the caves. In the 14th century, the Dogon people drove out the Tellem and they remain the inhabitants of this area to this day. 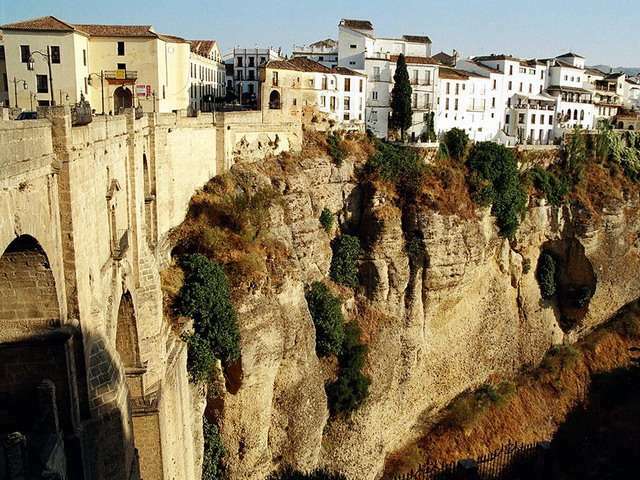 Ronda is located in the province of Malaga in Spain, famous for it’s city cliffs. 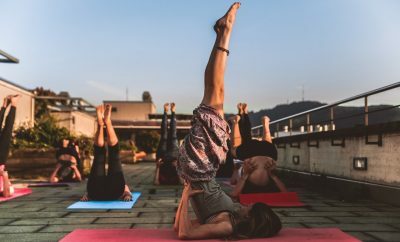 It is situated in the mountains at an elevation of 760 meters. 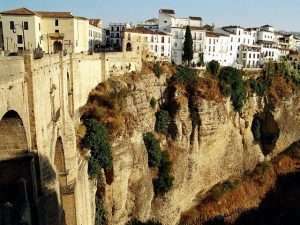 The city is split in two by the Guadalevin River that runs through Ronda and there are three bridges that precariously cross the canyon so that you can cross from one side of Ronda to the other. 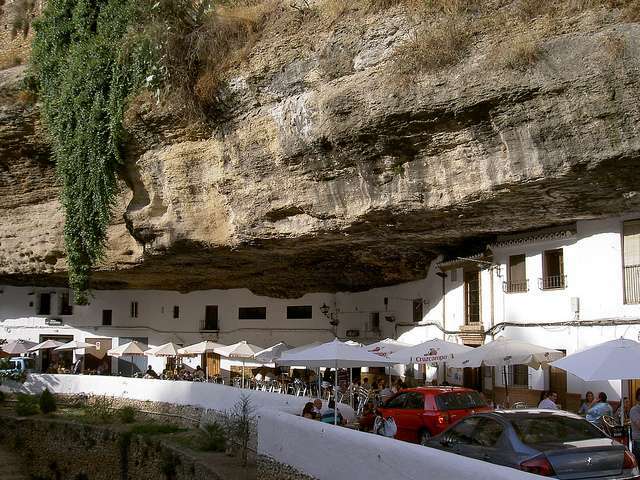 Ronda has the distinction of being the birthplace of bullfighting and Spain’s oldest bullfighting ring is still there. 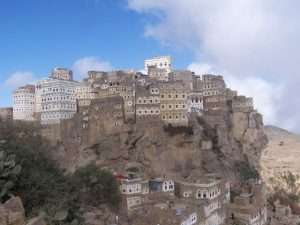 Al Hajjara,is a historical cliff city in the Yemen’s Haraz Mountains situated west of the city of Manakhah. The village was literally built into the mountain with quarried stone from the mountainside nearby and dates back to the twelfth century. 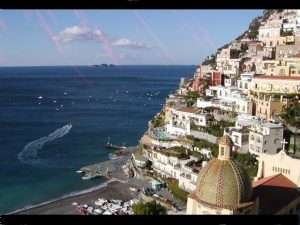 Positano is a small town Italy on the Amalfi Coast of Compania and a popular attraction with tourists. The city seems to be scattered from top to bottom down a hillside leading to the coast. 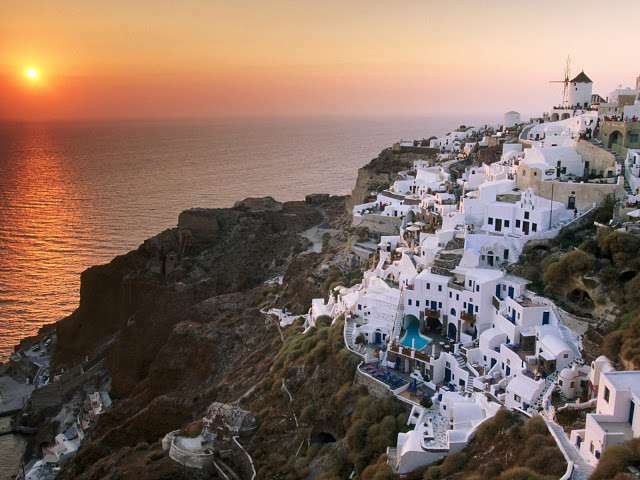 It has steeply-stacked houses tumbling down to the sea. Fira and Oia are the most famous villages of Santorini Greece, perched on the edge of the caldera and giving amazing view to the Aegean Sea and the volcano. White-washed houses cling on the edge of the 400 meter high cliffs. ← Previous Story Solar roadways have gone from futuristic to realistic.